Front and back of jewelry charm shown; Charm Size: 1" by 1-1/4". 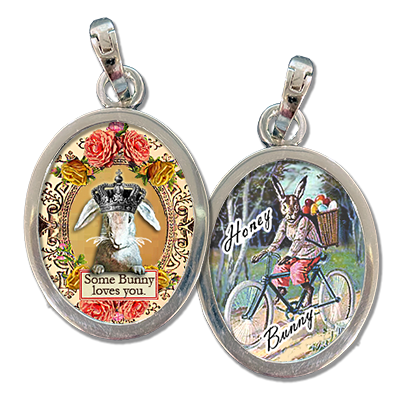 An ornately framed bunny rabbit shares the message "some bunny loves you" on the front of this holiday-inspired charm. The reverse side finds him riding his bike with a basket filled to the brim with Easter eggs. This beautiful piece just feels like spring has sprung.